Farms use phosphorus — one of the main culprits for algae blooms. One group has started collecting runoff from local farms, in the hopes of reducing phosphorus before it hits water ways. A handful of Chatham farms might hold the answer to reducing toxic algae blooms in the Great Lakes. These farms are collecting and analyzing their agricultural runoff, in hope of reducing the amount of phosphorus entering the waterways. It's part of a project, started by two organizations in Spring 2016, which aims to come up with a strategy to deal with toxic algae blooms. Out of that idea for the project — between the Ontario Federation of Agriculture and the Great Lakes and St. Lawrence Cities Initiative — came the Thames River Phosphorus Reduction Collaborative. The collaborative's goal is for cooperation between farmers, environmental and academic consultants and First Nations to reduce the amount of phosphorus entering area waterways by 40 per cent by 2025. The Thames River PRC estimates needing about $100 million over a ten-year period and has received funding from Environment and Climate Change Canada, the federal Growing Forward 2 program and the Canadian Agricultural Partnership. Algae blooms have been a problem for about the last decade, said Colin Little, the agricultural program coordinator for the Lower Thames Valley Conservation Authority. "They've become more severe, so that's one of the reasons we're looking at finding ways to reduce phosphorus in the water," said Little. "Harmful algae blooms can come in a lot of different forms. The one we're concerned about, on Lake Erie, Lake St. Clair and the Thames River is cyanobacteria blooms." Why are algae blooms bad? Can release a toxin called microcystin that is very toxic to human consumption. Have an impact on dissolving oxygen within the water which may cause fish death. 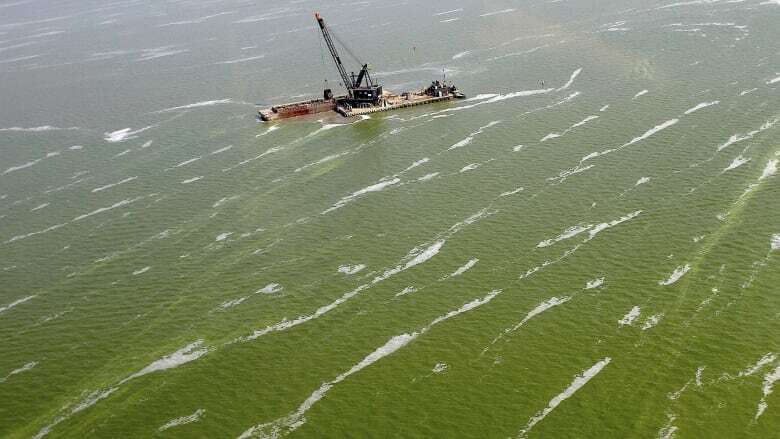 In 2014, a toxic algae bloom in Lake Erie shut down drinking water access to Toledo, Ohio. The same bloom closed beaches and led to a public health advisory on Pelee Island. A 2012 algae bloom caused thousands of dead fish to wash up on shore between Erieau and Port Stanley, Ont. According to Little, Lake Erie and Lake St. Clair are more susceptible to bacteria growth because they are shallower bodies of water. The 40 per cent reduction in algae blooms by 2025 is slightly ambitious, said Little. "When this was an issue in the 70s and 80s the predominant source was wastewater treatment plants," said Little. "Now the issue is generally non-point sources." To learn more how farmers are tackling algae blooms, tap on the audio player below. Non-point sources, like farmlands, are sources that don't have a single point of entry into the waterways. "We know that, at this stage, most of our phosphorus in the Thames River basin is coming from agricultural land mass," said Little. "Local farmers are really taking leadership to find solutions that work to reduce the phosphorus coming off their lands." One of those local farmers is Chatham's Louis Roesch, a member of both the Kent and Ontario Federations of Agriculture. He said they're "learning as they go." "We have about 25 acres that the water all comes through two systems to take the phosphorus out and monitor how much has been taken out," said Roesch. "The next project will be about 60 acres." Roesch said it will take about five years of study before they fully understand what's happening. "The flow from this 25 acres is directing to two tanks before they discharge," said Little. The system the water runs through has a material called NutriLox, which binds the phosphorus and removes some of it from the water. The LTVCA started testing on the Roesch farm in November of 2017 and began monitoring the water flow in spring 2018. "Flow is what drives phosphorus," said Little. "You need the rain to drive the flow." The LTVCA only has preliminary results so far — more than one season's worth of results is required for an accurate picture of how effective the process will be. "Now that we're getting into the more active time period, from October to about May (the non-growing season), this is when we'd expect to see higher concentrations," said Little. "It will be interesting to look at all of our data this flow season and see how effective we've been in the last five to six months." According to Roesch, even if phosphorus use was stopped completely, there wouldn't be an immediate effect. "There's enough scientific proof out there that if we stopped using phosphorus altogether right now, it wouldn't show up for about 20 years." The root issue is phosphorus entering streams and then rivers and lakes. Roesch knows they won't be able to fully stop phosphorus from entering the water system, but he wants to see how much they can reduce. Phosphorus is found naturally in soil and is added to soil on farms that use manure as fertilizer, as well as can be added through a variety of other functions. Roesch's farm tests the soil on a regular basis to manage phosphorus levels; therefore, he's only adding needed phosphorus and not any extra. "We use what we require," said Roesch. Roesch said they're trying to figure out the impact farmlands have on phosphorus water levels. He said what they're doing seems to be working. But Little said the government has to get serious about resources available for management, testing and experiments. "By no means is this going to be easy, but we need to start doing more work to determine what is working and how it's working," said Little. "This is something that is a global issue, and it's not just affecting freshwater bodies either." Roesch agreed, adding a lot more needs to be done. "There's not a single fix that's going to make this work."